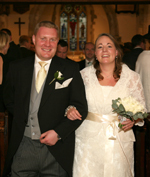 Sarah, thank you so much for doing such a superb job in taking the photographs at our wedding. As you know, before the event, we thought it was going to be the least favourite part of our day, but your attitude, professionalism and unobtrusive manner meant we hardly knew you were taking them and best of all we have lots of very natural and beautiful photographs of our day. You met our brief brilliantly! We have used Sarah for photographs on two very special occasions. event that we were hosting. On both occasions we found Sarah to be professional, creative and flexible to our wishes. We have since recommended her services to our friends and they likewise speak highly of her. We shall definitely be using Sarah again in the future. Gary & Zelda Croucher - June 2008.